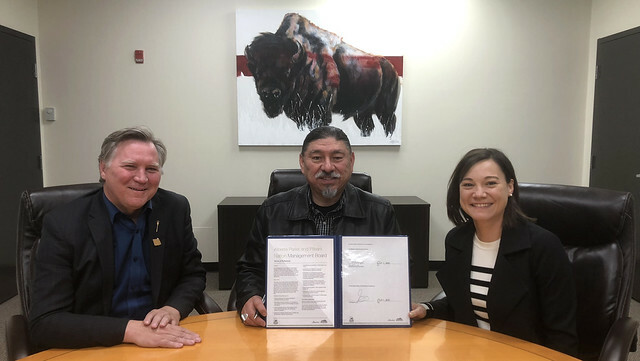 The Government of Alberta has signed a historic agreement with the Piikani Nation to ensure that treaty rights, traditional practices and Indigenous knowledge are better protected and fostered in the Castle region. (L to R) Minister Feehan, Chief Grier and Minister Phillips sign a historic agreement for Piikani Nation cooperative management in Castle parks. To support Indigenous knowledge and culture in the Castle provincial parks, Alberta Parks and the Piikani Nation have signed Cooperative Management Terms of Reference. This is a historical first, as the province places greater emphasis on traditional activities and treaty rights in parks planning. The Castle Management Plan was the first time Alberta Parks included a primary objective respecting Indigenous rights and a chapter devoted to First Nations. The terms of reference create a management board that will increase cultural practices on the landscape and protect access to areas of cultural significance. Piikani hunting and harvesting practices such as berry-picking, personal wood-harvesting, tipi poles and willows. Cultural practices such as sweat lodges or other ceremonies that require privacy or seclusion. Access management and protection of specific cultural areas of importance. Interpretation and education of Piikani history and culture, including appropriate use of Blackfoot language in Alberta Parks signage and naming. Economic development opportunities such as retail, guiding and interpretation services. Training of Alberta Parks staff to ensure awareness of Indigenous rights, culture and practices. The board will be co-chaired by two representatives, one appointed by Alberta Parks and one appointed by Piikani Chief and council. Up to six other members will be named to the board, including at least one Elder. The board will meet four times per year. The 103,000-hectare Castle Provincial Park and Castle Wildland Provincial Park were established in January 2017. More than $20 million over four years has been designated in general parks planning for access routes, inclusion projects, camping, signage, picnic areas and hiking trails in the Castle parks.